The Atlantis Grail has been optioned for development as a feature film series and/or TV series. They can only take a tiny percent of the Earth’s population back to the colony planet Atlantis. And in order to be chosen, you must be a teen, you must be bright, talented, and athletic, and you mustQualify. 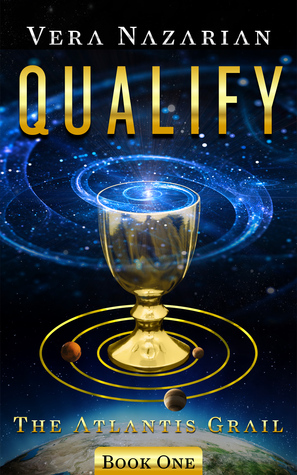 If you are good enough to Qualify, you are eligible to compete in the brutal games of theAtlantis Grail, which grants all winners the laurels, high tech luxuries, and full privileges of Atlantis Citizenship. And if you are in the Top Ten, then all your wildest wishes are granted… Such as curing your mother’s cancer. This time she is in over her head, and in for a fight of her life, against impossible odds and world-class competition—including Logan Sangre, the most amazing guy in her school, the one she’s been crushing on, and who doesn’t seem to know she exists. Grab your copy for only 99¢! Make sure you stop by Vera’s YouTube Channel where you will find fun videos of panels including the TAG Fan Discussion Panel where she announces the film option and explains the process of how a book gets optioned for film by Hollywood! Today is a day like any other day. Only it’s not. Today the Qualification tests begin—at all designated schools, and public sites in remote places where they don’t have schools, all across the country and around the world—and everyone in my family is trying to pretend things are as usual. I am at the messy kitchen counter chewing the breakfast scrambled eggs while the smart wall TV is blaring in the living room. Mom has her back turned and she is leaning over the stove making another skillet, which apparently is burning. I watch Mom’s fragile stooped back, the collar of the flannel pajama top, and the yellow cotton scarf covering her head, bald from the most recent round of chemo. The air is thick with garlic and scalded toast and things unspoken. No one else is up yet. “Need some help burning the house down, Mom?” I say, in-between tasteless bites. Normally I love cheesy garlic eggs, but not today. Today, nothing has a taste. Especially not my forced humor. “M-m-m-m,” I say. The skillet makes another grand hiss. Voices of various morning news show talking heads sound from the living room TV smart wall. “Qualify or die” is repeated often. I imagine there’s a running marquee with that phrase, interspersed with stock tickers and national weather and the continuing coverage of the mystery of a missing plane that disappeared thirty-three years ago, while the footage of the asteroid and then the Atlantis ships hanging in the skies like balloons among the clouds is running on repeat in a small lower window of the screen. Unfortunately that’s the spot of the smart wall surface with the greatest number of bad pixels. Our old wall needs an upgrade, but it’s not going to happen now that the world is about to end. They’ve been showing the same footage for the last three months. The asteroid is dramatic, a blazing white monster against black space. It’s hurtling at us head-on. And then it’s always followed by the video clip of the same famous spaceship disk, silvery metallic monolith, miles above the New York skyline. Most of Manhattan ground level is two feet underwater these days, but the skyscrapers remain active centers of business and make for a dramatic backdrop amid the street canals congested with taxi speedboat traffic. There are hundreds of other spaceships of course, all around the country and the world, but they only show the definitive New York one, with the Empire State Building in the frame. The ones here in Vermont, over Burlington, Montpelier, and St. Albans, don’t warrant national coverage. George comes into the kitchen. His dark brown hair is sticking up more than usual, which means he’s been tossing and turning all night, and probably had very little sleep, much like me. He looks bleary-eyed too, and his good-looking angular face is stuck in a frown. He’s wearing black jeans and a grey hoodie. “Hey,” I mumble at my seventeen-year-old older brother, and he only gives me the hard thoughtful look. How well I know it, since it’s the same look that I’ve seen in the mirror this morning as I tried to comb the snags out of my own brown hair, long, wavy and unruly, and stared into my hard blue eyes. Grumpy and thoughtful runs in our family. Or at least with some of us. George and I are alike that way, prone to serious, prone to scary quicksilver moods interspersed with sarcasm. And now that Mom’s really sick, we stopped laughing altogether. Good thing our two younger siblings don’t particularly share this hang-up. Twelve-year-old Grace has always been a giggle machine and chatterbox—though lately she gets weird anxiety attacks at night and has trouble falling asleep, then can’t wake up on time in the morning, and is always late. Dad thinks it’s because she is right on the border of the cutoff age for the Qualification, and it can go either way for her today. So she’s been quietly freaking out. As for Gordon, fourteen and sure of himself, he just hums whatever’s playing in his earbuds, and smirks a lot, also quietly, even when he fiddles with his art and woodcrafts stuff. Gordie is convinced he will not Qualify, but he claims he does not care—which is of course crazy, but if it makes it easier for him to deal, then what can be said? “I’m not hungry.” My brother pours himself a glass of cheap apple juice. “Yes, you are. You’ll need it. You can’t run all day on that sugary swill. And it’s going to be a very long day.” Mom turns around and grimaces, looking at the transparent yellowish baby-food liquid that George loves so much. Mom’s skin has an unhealthy grey tint, and at the same time her face is reddened by the heat of the kitchen stove. Both her hands are shaking slightly with the usual tremors. But there is determined focus in her watery blue eyes. I stare at her and see the effort she is making. Margot Lark, my mother, is the strongest person I know. “You shouldn’t be doing this. You shouldn’t be cooking.” George frowns and gulps down half a glass of juice at once. I watch his Adam’s apple move with each swallow, in tandem with the muscles of his lean neck. “I am not cooking. You call this cooking?” Mom smiles, throwing me a wink, in an attempt to get me to make my usual sarcastic commentary that indicates I still have a pulse. “I heard Gee Three flush the toilet.” George reluctantly takes a plate and Mom dumps half a skillet of cheesy yellow eggs onto it. In case it’s unclear, we’re the Four Gees, in order of birth: George, Gwenevere, Gordon, Grace. I still don’t get it why our parents decided to use names starting with the letter “G” for naming all their kids. Mom says she wanted a neat musical pattern to it, and for us to sound “elegant.” Mom is a classical opera singer—or was, before she got sick—so “elegant” is important to her. Dad says it was an old tradition on his mother’s Italian side of the family to use the same initial letter. Honestly, whatever. But everyone in school now calls us the Four Gees, and we’re stuck with it. “Gracie still in bed?” Mom continues, without glancing at George. I am still chewing the eggs, swallowing them dutifully like lumps of unknown stuff, and now I feel a familiar pang of fear twist my guts. We’ll be fine. Somehow hearing this makes it worse, brings it all home. Today’s the day. The day we’ve been prepping ourselves for, emotionally, psychologically, for weeks and months. And when I say “we,” that’s pretty much everyone on this planet. Teens and their parents. And all the people who care about them. And really, everyone else too, since they get to watch. They get to find out—even though they themselves are out of the picture, out of the running—they get to witness us make it or fail. Today we Qualify for rescue, for Atlantis. Or we don’t—which means we’ll die together with all the rest of the world when the asteroid hits Earth, in about nineteen months from now. . . .
There’s no way to stop it. But at least for some of us, there is Atlantis. Turns out, Atlantis is not a myth. It’s ancient history. There really was a great continent by that name in ancient times, somewhere in the middle of what we now call the Atlantic Ocean, spanning the infamous Bermuda Triangle, the Bahamas, and beyond, and it was home to a very advanced high-tech civilization that stretched around the globe. Supposedly, they had computers, the internet, super-medicine, weapons of mass destruction, probably gaming consoles, and all kinds of other incredible or obnoxious stuff even more sophisticated than our own modern equivalents. And then something happened. Maybe they did it to themselves—basically ruined the planet, kind of like what we’re doing now with the environment and other species, the out-of-control pollution, carbon dioxide imbalance and resulting cascade of climate change. Or maybe it was Mother Nature, at least in part. Because at some point more than twelve thousand years ago, something huge and terrible took place—a mega-cataclysm on such a scale that it caused a whole continent to disappear without a trace, in earthquakes and floods and who knows what—and wiped the high-level civilization off the face of the planet. To escape this global disaster—we are told—the people of Atlantis used their advanced technology to leave Earth and flee to the stars. They eventually established a human colony on a habitable planet. They called this colony planet “Atlantis,” or whatever’s the equivalent in their language, in memory of their own ancient roots on Earth, to honor their native civilization and the terrestrial continent of their birth that started it all. And now, after all these thousands of years, they’re back. They returned to Earth, their ancient home world, and they are here to help. That is, the distant descendants of the original Atlantean colonists are here to help. They claim to be one hundred percent human and supposedly not all that different from ourselves—if you don’t count the thousands of generations of separate evolution and branching off to live in an alien environment. Yeah, right. Anyway, the Atlanteans share our DNA and they’re our cousins. And, just like cousins, it makes them either weird or welcome guests. Whichever it is, at this point, Atlantis is all we’ve got. When the news of the lethal asteroid first broke, months ago, almost simultaneously the Atlantean spaceships appeared in the skies all over the world. It’s as if they’ve been watching us, and waiting to make first contact. The asteroid just gave them the excuse. Okay, at first it was a huge global mess. World governments going into panic mode and military overdrive, people on the streets screaming about alien invasions, religious fundamentalists having a field day, scientists having aneurisms, stock markets crashing worldwide, to the tune of billions. But once the Atlantean shuttles landed, and we saw them to be human and not little green men or big green lizards, it was okay. They met with representatives of governments, the United Nations, and were received with caution and eventually with open arms. “We are you,” they told us in various languages of Earth. How they knew our languages is unclear, but it’s probably some kind of advanced tech, or they’ve been listening in on us for far longer than we know. They explained who they were—which is kind of insane if you think about it, all that mythic stuff that Plato wrote about is mostly true—and demonstrated some of their amazing technology. Only it wasn’t all that amazing when it came to the asteroid. Yes, they tried moving it and changing the path of its trajectory, and all kinds of other advanced science stuff, in conjunction with global space agencies and the three International Space Stations we currently have—the largest one in Earth orbit, a second small one on the surface of the Moon, and the barely functional newest one on Mars. They even landed on the asteroid’s surface and drilled and took samples. But nothing worked, at least not enough to make a difference. The asteroid is going to hit Earth and it is going to cause nuclear winter at best. And at worst—well, let’s just say there may not be much of this planet left after the impact. . . . However, not all is lost. Because the Atlanteans are going to save as many of us as possible and take us back with them—back to the colony planet Atlantis, a fertile blue-green world that’s supposed to be beautiful beyond belief, with a golden-white sun and not one but three moons. To that effect, they have brought enough spaceships to carry millions of people—ten million, to be precise. It sounds great but means they can only rescue a very small portion of the general Earth population of eight point five billion—no more than can fill their present fleet of monolith silver ships, since there is no time for multiple trips between Earth and Atlantis before the asteroid strikes. There is only one condition for rescue. Those lucky few that get to board the Atlantis ships have to be young people between the ages of eleven and twenty—teenagers. The best of the best on Earth. And the only way to determine who these teens will be is to make them pass Qualification. . . . The smart wall in the living room is playing TV snippets of a canned interview with the President. Later tonight she will address the nation live. . . . But for now it’s old footage. President Katherine Donahue is speaking in her usual droning and soothing voice that’s powerful and at the same time conciliatory, in that nasty mixture that only politicians manage. “Our children and we must be brave together, but rest assured, no one’s giving up” and “we hold them in our prayers as Qualification looms” and “the ultimate survival and benefit of humanity might ultimately depend on well-orchestrated air strikes” are some of the phrases heard. Same old junk they’ve been saying for months, as soon as they figured out that nothing substantial could be done to stop the asteroid, and that the Atlanteans are not all-powerful after all, despite what everyone hoped. Thing is, the governments, the global leaders, the media, the scientists, the talking heads—they all feel the guilt-ridden need to keep talking, keep trying, even up to the last, even as the world goes up in flames or ash clouds or whatever. “Vaporware Hope,” as Dad calls it, is one way to fill up the void between now and the end. Sure, there’s Qualification. But for the human spirit that’s just not good enough. To that end, there are also numerous space missions being prepped by the United Nations and private conglomerates, by individual governments and science agencies. Everyone’s building shuttles, rockets and “payload delivery systems,” whatever that means, to see if they can blast the asteroid into manageable bits or move it out of the fatal earth-contact trajectory. Meanwhile, others are building spaceship arks, just to get off the planet—kind of like the ancient Atlanteans themselves did, thousands of years ago. I guess they think, maybe if they can just get far enough away from the blast and resulting atmospheric turbulence, the Atlanteans might guide them the rest of the way? The Atlanteans observe these various efforts sadly, and have indeed volunteered to assist to the best of their abilities. But the reality remains grim, there’s not all that much that can be done, at least not for the majority of living beings on Earth. The asteroid is huge and supposedly made up of mostly heavy metals and some other newly discovered stuff that makes it pretty much impossible to move or damage—or so they say. And as for escape, there are simply too many people, animal species, and too few ships. The stairs creak softly under Dad’s familiar steady footsteps. He comes down, fully dressed in his nice beige blazer, black shirt, brown slacks, tweed vest. And he’s wearing a tie, which is a rare thing. My father, Charles Lark, is the epitome of academia, with his rimless spectacles, somewhat tousled, wavy brown hair and greying temples. He is a professor of classics and history at the local University, and is exactly what you might think that means. Smart, and a little eccentric, and living mostly inside his head, his lesson plans, and research, with plenty of oddball stories and trivia to tell to his kids. “Let’s please turn the awful TV off,” Dad says tiredly. He is bleary-eyed too, and he is immediately looking at Mom. “How are you feeling? You really shouldn’t be up so early, straining yourself.” Dad goes directly for the coffee maker. “Why, what’s today?” George says grimly. “I hate that Goldilocks guy and his BS,” George mumbles. Goldilocks. That’s the derogatory term being used lately to refer to Atlanteans, because supposedly they all color their hair metallic gold, which is a fashion statement. Or maybe it’s an indicator of rank. No one’s sure. Apparently, gold’s so common and abundant on Atlantis, that it’s considered a base metal. . . . In that moment, the stairs groan as Gracie and Gordie come downstairs one after the other, Gracie trailing. My younger brother Gordon is slight and skinny, lacking the sinewy strength and height of George, and with brown hair that’s several shades lighter and so short it’s almost buzzed. He’s wearing his usual dingy jeans and faded black sweatshirt with paint stains on it. And his rimless glasses have dirty finger spots you can see from several feet away. Gracie is last. She is a younger version of me, tall and slim, except without any curves and with straight long hair that’s dirty blond instead of dark like mine. Gracie is dressed up in pastel pink skinny jeans and a black sweater with sequins. She is wearing black eyeliner, mascara and lip gloss, and gaudy plastic bangles on her wrists. Normally Mom would say something about the eye junk and the lip gloss, but today Grace Lark gets to wear whatever she likes—whatever gives her strength. “Thanks, Mom. Pile it on.” Gordie heads right for the kitchen counter and pulls up a chair, while Gracie stops in the middle of the kitchen and stares. Her face is very pale, and she looks sickly, despite her mascara and lip gloss. Or maybe because of it. “Gracie, honey, don’t waste time, please.” Mom picks up a clean plate and starts filling it. Gracie shrugs. I can’t believe she is this quiet. She’s not even calling me an idiot. Gracie silently slips onto a chair at the counter and reaches for a slice of toast. A few minutes later we’re in the old minivan, headed for school, with Dad at the wheel. We still feel Mom’s tight desperate hugs and ringing-hard kisses on our cheeks. In my mind, she’s still standing at the porch, waving, and her eyes are red and swimming in tears as she watches us drive away. If we Qualify, this will be the last time we ever see Mom. Already I am fixing this image of her, searing it into memory. Usually George drives us in his peeling truck, but today Dad is bringing us in, as if to make sure we are delivered properly in time for the Qualification tests. All our duffel bags are packed in the trunk, in addition to the usual school backpacks. Everything’s according to the official Qualification instructions that have been handed out, weeks in advance, by the schools that are designated RQS, or Regional Qualification Sites. Our bags contain a basic travel kit, a change of clothing, and a few personal items that are up to us. The assumption is, if we advance in the Qualification preliminary stage, we will be taken directly to the Regional Qualification Centers where the next stage of the process will take place. And we don’t get to say goodbye to anyone. My duffel bag has a few of my favorite books including The Iliad, The Odyssey, The 101 Dalmatians, and The Birthgrave. Okay, it has a lot of books, and is heaviest, almost exceeding the forty pounds limit. That’s because these are actual honest-to-goodness books, printed on paper. Yeah, you heard that right. Some of them are rare collector editions from Dad’s library. Dad often says that an electromagnetic pulse or EMP disaster can strike any moment and destroy our digital information storage capability, so he’s been hoarding the paper print editions like precious treasure for most of his life. His personal library is amazing. And now here’s my chance to save some of those classics before the asteroid takes them first. In addition to the load of books, my bag also has a small pouch of trinkets. There are family photos, a tiny rose crystal Pegasus figurine, and a sterling silver dancing fairy locket my parents gave me for my sixteenth birthday a few months ago. It’s not electronic-enhanced smart jewelry, but it has heart. George has chosen to pack close to nothing of personal value, only an extra pair of running shoes and some flat rectangular thing wrapped in brown paper, plus a bunch of paper books for Dad’s sake. In contrast, Gordie’s duffel has micro-bead CDs, rare sheet music, and his skinny Backpacker travel guitar, in addition to his favorite weird quartz pieces from his extensive rock collection, a purple geode, a Swiss Army knife, a portable color pen-and-pencil art box, and a sketchbook. As for Gracie, she has taken her costume jewelry including a pair of latest version smart earrings, a cosmetics pouch, and her flute. And yeah, more of Dad’s books. I stare outside the window at the bleary landscape. It’s March, but snow is still on the ground, and the sky is overcast. However, as I stare southeast, the Atlantean ship in the sky over St. Albans can be seen in the corner of the window, through the tall pine and maple trees. From this distance it looks like a flattened weather balloon, silvery metal. In reality, I know it is massive, almost a mile in diameter. It hovers, motionless, silent, eternal. Gordie, Gracie, George, my Dad, all of us glance at it periodically. “Oh great, do we have to listen to this?” Dad says. George invokes the scan function on the radio and it jumps to a music station. Gordie just stares out the window with blissful indifference and his earbuds are crackling with his own entertainment. “All right.” Dad is turning off the main highway onto a smaller road that’s near our high school and Gracie’s middle school, both in the same complex. Our schools are a designated Regional Qualification Site. The traffic is busier than usual, as parents from other school districts are dropping off their children, and everyone wants to be on time. Car horns are blaring. We make the turn into school grounds and the rows of yellow buses are already lined up in the parking lot, ready to take those of us who are lucky enough to pass the preliminaries on to the next stage of Qualification, hours later. “I don’t want your tips! I want what that program was going to say!” Gracie’s voice rises in that same whiny awful noise that has been produced by her for weeks now, whenever something doesn’t go her way. “Oh, jeez—” George shakes his head. “I want to hear Dad,” I say. Gracie turns around and glares at me. Her hand is still clutching the back of the seat in front of her with a white-knuckled grip. “Are you done?” Gracie says. “Thanks for the words of wisdom, Dad. That’s actually gold in them thar hills. I bet you wrote it up last night in your lecture notes. Am I right?” George mumbles while looking straight ahead, as he begins to get ready to unbuckle his seatbelt even before we are parked. The minivan is still crawling along in a line of cars through the parking lot and onto the football field that has been designated as supplementary parking. Security guards stand, waving the cars into parking spots or designated drop-off points. There are also several media news vans and vehicles with video and sound equipment. Even now, they are filming us live. It’s weird to think, but all that’s happening right now is being recorded, is breaking news. . . .
We stop not too far from the side entrance to the main school building, in the yellow zone. Kids and parents are everywhere, opening cars, carrying bags. Many people are crying. We get out, and Dad pops the trunk, which sails open slowly. Shivering in my jacket from the chill morning air, I stand waiting for George to get his duffel bag, while Gordie has his already. Grace stands right behind me, breathing down my neck. Dad stops the engine and comes around to help us. Or more likely he is gathering himself for the big goodbye. I glance around, seeing students I know, other classmates, heading up the stairs and inside, past security. Carrie Willis, a girl from my class rushes by with tear-reddened eyes, dragging a bulky, ugly purple-and-orange travel bag that’s rolling along on squeaky wheels. Her mom and some other relatives watch below, waving and sobbing. “Yeah, that one there seriously needs new luggage.” George steps back, shouldering his bag and his backpack with muscular ease. “No, I mean, this, all of this situation—she, they, us, everyone, the world,” Gordie says. I lean forward and take my turn with my stuff. It feels surreal, like someone else is going through the motions. My backpack is hoisted up and lands on my back with a thud that’s lessened by the stuffed lining of my winter jacket. I adjust the straps on both arms, then reach for the heavier duffel. Gracie is starting to sniffle behind me, and I hear Dad embrace her in a bear hug. I suddenly feel a burning in my eyes. In the back of my throat a huge horrible lump is gathering. No, I am not going to cry. But the pressure is building in my sinuses, and as I keep my eyes open wide, afraid to blink, already I can feel the first stupid fat teardrop starting to well in one eye, as my vision gets blurry. I back away from the minivan, while Gracie disengages from Dad’s hug, wipes her face with the back of her hand—which smears her eyeliner on one side—and goes for her bag with trembling hands. I stand watching the peeling spots of paint on the wall of the school building, while blurs of students are going past me up the stairs. I am momentarily distracted from needing to bawl by the familiar faces. Mindy Erikson walks by with her stuff, and her flaming red hair. . . . There goes football jock Nick Warren and his younger brother, whatshisname. “Gwen, honey . . .” Dad’s voice cuts through everything, and it makes me turn around and look at him, and face him at last. “Here, my sweet girl, there you go,” Dad says, reaching out for me, and I meet his eyes, and it breaks me completely. Dad. . . . This is my dad, and he is going to die. I am glad that next comes the great big hug so he doesn’t see me start to lose it. Instead I lose myself in his chest, and crush my face against the beige blazer, and think about how he’ll have to have it dry cleaned to get my stupid tears and snot off the fabric. I stay that way for several moments, shaking silently, feeling Dad’s powerful embrace and smelling the faint aftershave and wool scent of his clothes. I let go, and stand back, and smear my face with the back of my hand, and that’s it. I watch Dad take Gordie in a quick tight hug, and pat his back, and then George, who evades the hug and instead gets a grownup handshake. “Well, this is it,” Dad says. He takes a symbolic step back and nods at us, and says, “God speed, go on, all of you! I promise you, the Lark family will Qualify, hands down, all four of you!” I see Dad’s eyes are sort of red too, as he just stands there, looking at us through his spectacles. George nods briefly, and just for a moment he is suspended, motionless, like a post. He turns and gives the rest of us a serious look. “Okay! Let’s do this. See you on the flip side.” And George heads up the stairs. Gracie and I take a moment longer, to give Dad another last look. And so I take my sister by the arm, and pull her along, and we start up the steps. We enter the school building without looking around again at Dad. 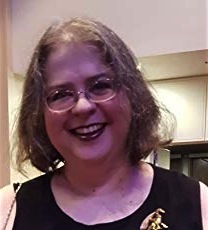 VERA NAZARIAN is a two-time Nebula Award Finalist, a Dragon Award 2018 Finalist, an award-winning artist, and member of Science Fiction and Fantasy Writers of America, a writer with a penchant for moral fables and stories of intense wonder, true love, and intricacy. She is the author of critically acclaimed novels DREAMS OF THE COMPASS ROSE and LORDS OF RAINBOW, the outrageous parodies MANSFIELD PARK AND MUMMIES and NORTHANGER ABBEY AND ANGELS AND DRAGONS, and most recently, PRIDE AND PLATYPUS: MR. DARCY’S DREADFUL SECRET in her humorous and surprisingly romantic Supernatural Jane Austen Series, as well as the Renaissance epic fantasy COBWEB BRIDE Trilogy, and the high-octane adventure YA / teen dystopian apocalyptic bestselling science fiction series THE ATLANTIS GRAIL that has been optioned fordevelopment as a feature film series and/or TV series. Take the Atlantis Color Quadrant Quiz here!